Fastly provides several levels of cache purging. You can purge something as small as a single URL via the "Purge URL" command or as large as all content under a service via the "Purge All" command. 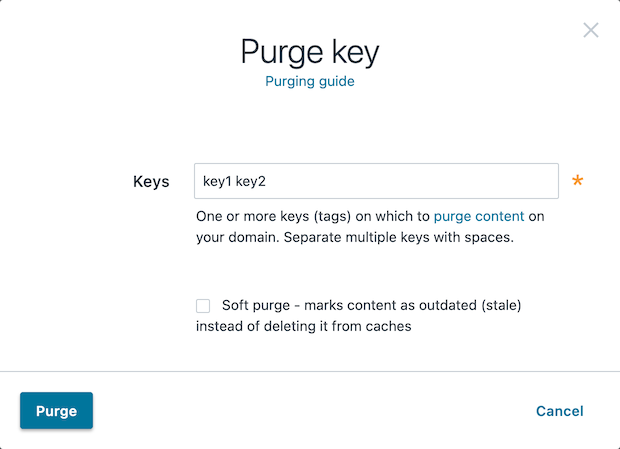 You can also selectively purge content via key-based purging using the "Purge Key" command. 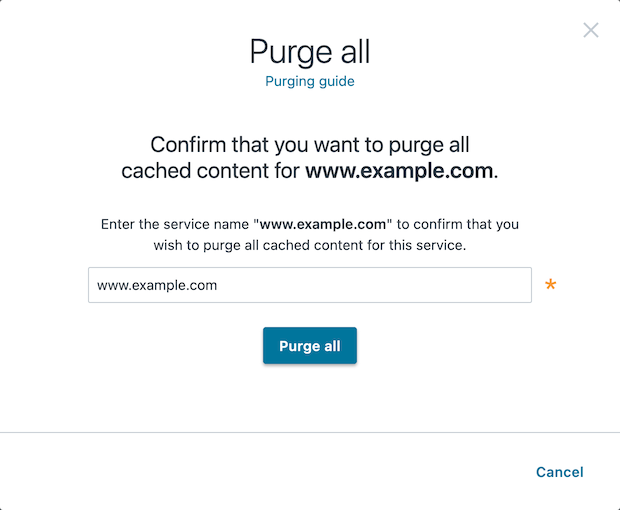 We also provide a purging feature called Soft Purge that allows you to mark content as outdated (stale) instead of permanently deleting it from Fastly's caches. 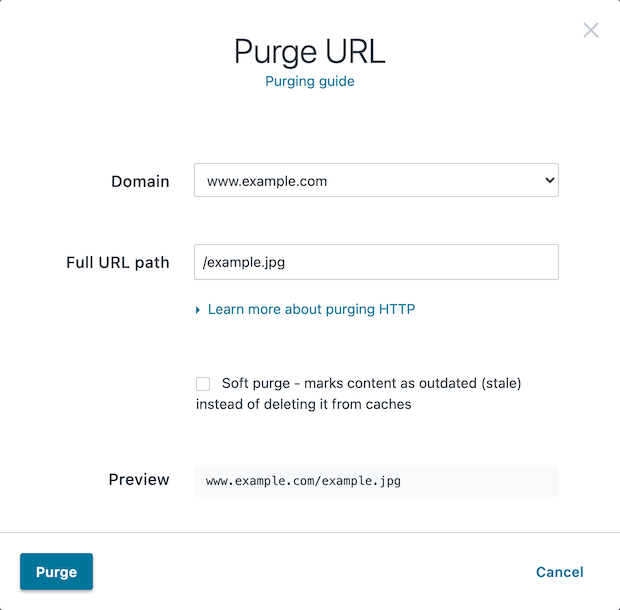 TIP: To mark content as outdated instead of permanently deleting it, check out our Soft Purge feature. You may also be interested in our wildcard purging. To purge content using the Fastly web interface, choose one of the purging methods below. From the Purge menu, select Purge URL. The Purge URL window appears. From the Domain menu, select the domain on which your content resides. If the domain you select is a wildcard domain (e.g., *.example.com) the Subdomain field will appear. If the Subdomain field appears, type the subdomain to purge for the wildcard domain you've selected (e.g., www). In the Full URL path field, type the path to the content you'll be purging (e.g., /example.jpg). The Preview field displays the URL that will be purged. Optionally select the Soft purge checkbox to mark your content as outdated instead of deleting it from cache. From the Purge menu, select Purge Key. The Purge Key window appears. In the Key field, type one or more surrogate keys. Use spaces to separate multiple keys. WARNING: Do not purge all cached content if you are seeing 503 errors. Purge all overrides stale-if-error and increases the requests to your origin server, which could result in additional 503 errors. From the Purge menu, select Purge All. The Purge All window appears and displays the exact domain you'll be purging. The syntax for purging a service through the API can be found in the Purging section of the API documentation.